Although most of the information in the replacement windows and replacement doors section of this website refers to PVCu doors, we will deal with hardwood doors and aluminium doors. And for those who are interested, we will answer the question – what is PVCu? and look at the many different types of PVCu profiles which exist for replacement windows replacement and doors. 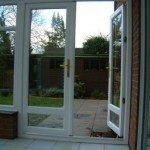 So if you are looking for a window quote or a door quote you have come to the rights place. If you are considering a hardwood replacement doors quote, good quality hardwood is generally the most expensive product used to manufacture windows and doors but it is also considered by some to offer the best in terms of appearance. The availability of some poor quality hardwood has ruined this argument in recent years however, and although many traditionalists would never contemplate anything other than hardwood replacement windows and replacement doors, PVCu has many advantages, not least cost and ease of maintenance. Softwood replacement windows and replacement doors are inevitably the least expensive but have a much shorter life span than other product options, need regular painting and maintenance, and are generally not as energy efficient. If you are looking for an aluminium door quote, aluminium replacement doors are also expensive, partly due to the fact that they are normally fitted within hardwood sub-frames, and they are not usually as energy efficient as PVCu can be. Aluminium replacement windows and replacement doors are generally more appropriate for commercial installations such as shop fronts and other business premises than for use in residential properties. Most homeowners are considering PVCu replacement doors quotes as that is the product of choice for most residential customers. 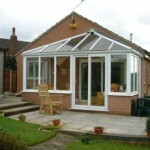 For that reason we will concentrate on PVCu replacement windows and replacement doors throughout the rest of this web site. PVCu replacement windows and replacement doors don’t just have to be white though – there is a wide range of different woodgrain finishes available including mahogany, rosewood and light oak effects. In fact in recent years, even coloured replacement windows and replacement doors such as red, blue, green and black have been made available. 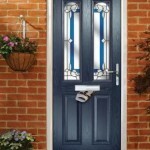 Add to that the ever expanding range of decorative glass features such as Georgian bar, Astragal bar, coloured lead patterns and bevelled glass and there are offer millions of combinations of PVCu replacement doors combinations to suit every home. Residential door is the term given to ordinary single doors, including PVCu, timber and composite doors and generally refers to the main front or rear entrance / exit door. Residential replacement doors often have one or more fixed side panels, or an attached ‘flag’ window. Replacement doors: Too much choice? 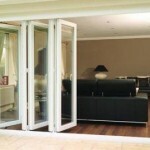 When you are looking for a quotation for replacement windows or replacement doors, too much choice can cause confusion. When you invite a sales representative into your home to quote for new replacement windows, replacement doors or a conservatory, you may be impressed by the level of knowledge they have and the care that goes into the design. What you will not get though is objective, un-biased advice because for all of the friendliness and empathy the sales representative imparts, they are there for one purpose only – to sell his company’s products, at the highest price he can get away with! Just a Quote will introduce you to up to four qualified and experienced installation companies who will carry out a detailed survey and provide a free quotation for replacement doors. During the survey they will listen to your requirements, show you sample products or brochures and discuss the many options which are available. 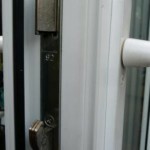 Security systems on PVCu doors have progressed from single operation locks and frames with little reinforcement to full steel or aluminium reinforcement and shoot bolt locking systems. Opposing hook bolts and anti-jemmy locks on the hinge side of doors have also been added over the years. Early PVCu door panels consisted of no more than a thin sheet of PVCu with a polystyrene core for insulation and they offered very little by the way of security. It was relatively easy to cut through or even burn through the PVCu panels. Today’s PVCu door panels tend to have two PVCu ‘skins’ pressure bonded to a core material of E.H.D.F.R.A. polystyrene (extra high density fire retardant additive which is also free from harmful CFCs) using heat and moisture resistant adhesives. Sandwiched within the polystyrene should be either a metal or MDF sheet for added security. The insulation qualities of the latest PVCu doors could never have been imagined back in the 1960’s when double glazing in aluminium frames was introduced to the United Kingdom. Consider this…..first the bad news….. There are fewer industries that have been criticised in the way that the replacement window and door industry has been in the United Kingdom. The stereotypical ‘double glazing salesman’ is disliked and ridiculed along with tax inspectors and second hand car salesmen, and sometimes for very good reason. Most home owners have heard stories of dubious sales techniques; false discounts, poor quality installations and non-existent after-sales service – and the statistics don’t help either. There are approximately 17,500 window, door and conservatory installation companies in the United Kingdom and they carry out over two million separate installations every year. In the year to March 2011 however, Consumer Direct received approximately 85,000 complaints regarding home improvements, with approximately 15,000 of those specifically about windows, doors and conservatories. There are however, some excellent, well-designed products available which are diligently installed by experienced craftsmen who take pride in their work and who are employed by companies which genuinely do care for their customers. Major advancements have been made in the technology and design of new products over the past few decades which have resulted in a much better offering for domestic customers. Alongside this, regulations governing the standards which good quality windows and doors should meet have been strengthened and policed to help improve the industry generally. PVCu products which are designed to resemble real timber are much more realistic and durable than the early versions which not only looked false, but faded badly in sunlight. Equally, composite windows and doors, which are now available in a wide range of colours and wood grain effects, mean that the days of any colour you want as long as it’s white, are long gone. In fact you can even change the colour of your existing white PVCu doors.